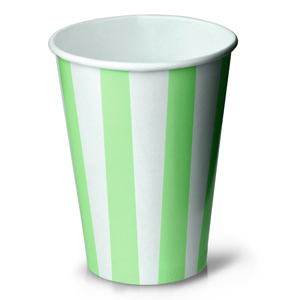 The Green Striped Milkshake Paper Cups are the retro infused way to serve a classic milkshake or smoothie. With a polyethylene coating to improve strength, these milkshake cups are the perfect choice for cinemas, milkshake bars or fast food restaurants. Not just limited for drinks, the vintage striped design lends itself to serving popcorn or pick n mix. These striped paper cups are certified as fully recyclable, ideal for commercial use.